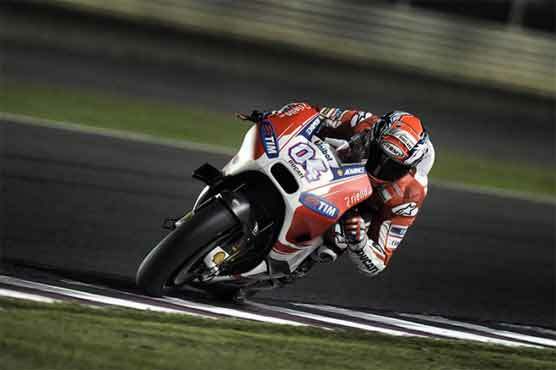 Andrea Dovizioso registered the quickest time in pre-season testing at Qatar’s Losail circuit. DOHA (AFP) – The Ducati of Italian Andrea Dovizioso registered the quickest time in pre-season testing at Qatar s Losail circuit on Sunday. Dovizioso topped the timesheets with a lap of 1.54.907, with Honda s MotoGP world champion Marc Marquez second at 0.184. The second factory Ducati belonging to Andrea Iannone was third in front of the Yamahas of Jorge Lorenzo and Valentino Rossi. Testing continues at the circuit on Monday with the new MotoGP season getting underway back in Qatar on March 29.